Loose dentures can leave you feeling frustrated, restricted and lacking in confidence. 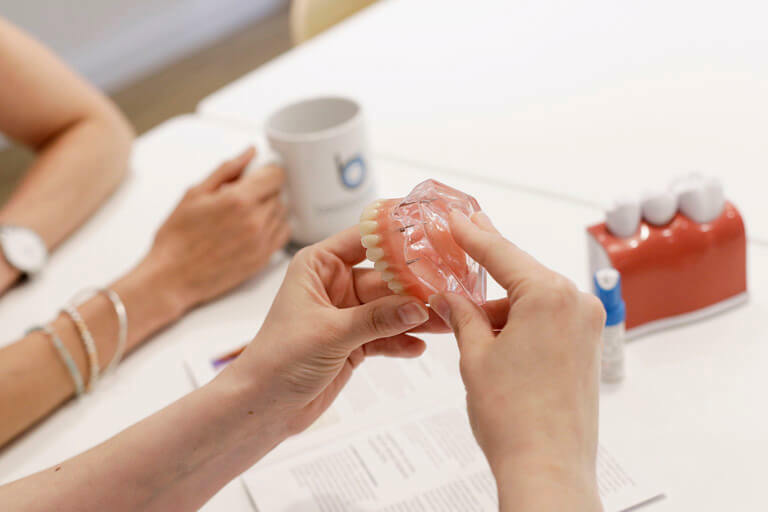 At Beeston Dental Practice, we can use dental implants to secure your dentures for a full set of natural-looking teeth. There are also great benefits for your dental health. Dental implants integrate with your jawbone to keep it strong and healthy while slowing down bones loss. Act like natural teeth, giving you confidence and restoring your quality of life. Your implant-retained dentures can last a lifetime with proper care and good oral hygiene. This cost-effective solution works by fixing your dentures onto 2 lower-jaw implants and 4 upper-jaw implants. It can also be used for partial dentures. You’ll be able to bite, chew and speak much more naturally – and we’re sure you’ll find that you smile far more often. Our implant dentist will assess your suitability and advise on a suitable solution. You’ll have every opportunity to ask questions and we welcome this, to ensure you are completely comfortable with the procedure. Placing is performed quickly and is relatively pain free. The final step is for your dentures to be fitted onto the implants. We’ll also check fit, comfort and match to your other teeth if your dentures are partial and advise you on the best aftercare. I am really impressed by the excellent care that I have received. I have been a patient at Beeston Dental Practice for many years now. I recently decided to have upper and lower implant-retained dentures, which has improved my quality of life significantly. After receiving my new set of dentures, I have experienced greater confidence and satisfaction. I would like to thank Chris and his team for providing me with a new more confident smile. What benefits are specific to implant-retained dentures? Implant-retained dentures will feel much more natural in your mouth than dentures alone. That’s because the implants connect your dentures to your jaw bone in much the same way your teeth used to be connected to your jaw bone. Your dentures will be much more retentive, more stable and easier to eat and speak with. You’ll notice that food tastes better as your upper teeth will no longer cover the roof of your mouth and biting and chewing will be far easier. How long do implant-retained dentures last? They can last a lifetime if you care for them properly. How do I care for implant-retained dentures? In general, you should clean your dentures and implants twice a day with a denture brush for your denture and a tooth brush for your implants. Each patient will be different, and our team of nurses and hygienists will devise a patient specific cleaning regime for you. Often interdental brushes are useful for cleaning tricky and hard-to-reach areas. Giving up smoking will help to protect your jawbone and it’s important to visit us regularly.